A GREAT SHAPE CAN REINVENT YOUR MARKETING! Have you ever thought about what a specially cut or shaped piece can do for your message? A rounded corner to soften the piece, or a strategically placed window to reveal just enough to entice the person to open and see what’s underneath. A die cut can help create the differentiation that will make you stand out from the crowd. It can reinforce your brand and what it stands for. At James Printing, we can help you reinvent what your marketing says about you. Die cutting can be a great option for creating tailored materials that feature unique shapes, edges and message windows. 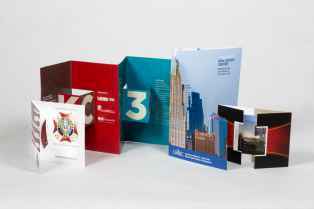 Using true letterpress die cutting, we offer perforating, scoring and final conversion of pocket folders, booklet covers, stationery, ticket wallets and more. We offer die cutting for projects ranging in size from very small to 28” x 40” so we can handle just about any kind of shape or size you might need. We also have a huge library of existing dies that customers can access to help control project costs. However, if you’re looking for a unique die that is all your own, our pre-press staff has the experience and knowledge to create the die tracings that are perfect for your project. 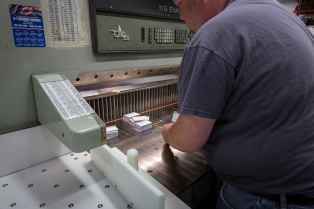 At James Printing, we do almost all of the die cutting in-house. This way we have more control over scheduling and product quality as well as keeping costs low. We stand behind every project that goes out the door because we want to ensure you’re completely satisfied with each project’s outcome. Contact Us and let us help you with the perfect die cut for your project, big or small. We have the experience to make sure you’ll be remembered.